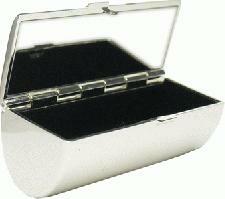 Nickel plated lipstick holder brought to you by Calendar Lady Promotions. The Lipstick holder with flat top is perfect for personalising to suit your needs, whether it be for use as company equipment, promotional gifts, or freebies to hand out to your customers. Stop lipstick going all over your handbag by keeping it in one of our quality nickel plated cases. For a free quote on our Nickel Plated LHolder please click here for our online enquiry form.